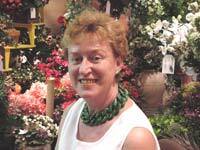 Barbara Park, An Australian entreprener, has lived and worked in Hong Kong for over forty years. For twenty five years she has been operating Plant~a~Park. 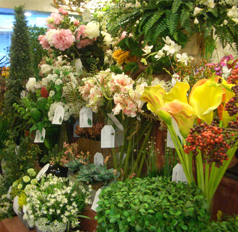 Barbara's parents and grandparents have all been keen gardeners, and she, too, runs a very large garden in Hong Kong, which equips her well in her understanding of the world of both natural and man-made plants. Understanding the juxtaposition of complimentary plants is essential to both disciplines. In 1980 a chance acquantaince with friends working with Hong Kong Bank resulted in an introduction to the architectural firm working on the new Headquarters. Barbara submitted her own man made trees, at that time sourced from the Philippines, these were selected to "green" the entire forty two floors of the building with three hundred trees. A business was "born" and has not looked back. During the boom years of the 1980's, Barbara worked with many progressive architects and designers who led Plant~a~Park to the hotel industry. Over the next twenty years Plant~a~Park became the supplier of choice for the Shangri-La Group, designing and installing plants in hotels in Harbin, Beijing (Kerry Centre, China World) Dalian and elsewhere in China. The Plant~a~Park crew has worked on shopping malls in Hong Kong and China, with most of their tree manufacturing carried out in the Philippines, and pot/planter manufacturing carried out in China. They provided preserved palms for the then new Chek Lap Kok Hong Kong Airport for the Airport Authority, and many projects for the Swire Group, such as Citiplaza and Taikoo Place, Citygate in Tung Chung, Festival Walk in Kowloon Tong as well as their flagship Pacific Place in Admiralty. Since 2000, Barbara and her team have designed and installed planting schemes in Macau for Casinos such as Venetian, MGM Grand, Hard Rock, and City of Dreams. They also design and manufacture their own fibreglass and GRC planters and pots. Barbara was asked to design a large bamboo installation for the new Hong Kong Police Headquarters in Wanchai, which has led on to a number of other Hong Kong Government projects instigated by the Architectural Services Department, including NTS Police Headquarters in Tsuen Wan and the new Customs Headquarters in North Point. Plant~a~Park is known for not repeating a design. Barbara and her team look at a site, and design a planting scheme appropriate to the architecture, location and customer base. Barbara is an active member of the Hong Kong Gardening Society, and a frequent volunteer consultant to the Leisure and Cultural Services Department of the Government relating to their care of trees in Hong Kong. Barbara is truly a "green" person, never happier than when she's dealing with plants.